A vast majority of this page has been contributed by Carlo "Setzer The Gambler" Savorelli, with various information and pictures being taken from this Japanese page. 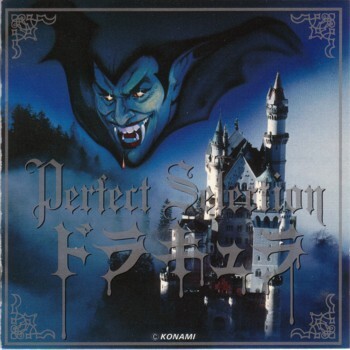 Served as a model for cover of the Dracula Perfect Selection album (not the same as the original Castlevania cover, despite the similarity) and the intro to Symphony of the Night. 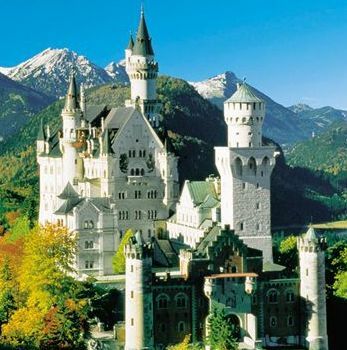 Castle Neuschwanstein was built by the slightly crazy King Ludwig the II in the late 1800s as a place for social solitude. It was opened to the public shortly after his death. 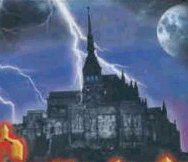 Check the official homepage for more information, or play the PC game Gabriel Knight: The Beast Within for more info about King Ludwig. 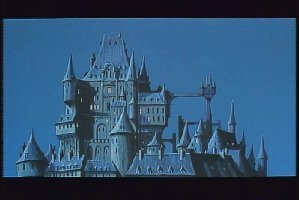 This castle appears on the cover of Akumajou Densetsu (the Japanese Castlevania 3), as well as the American cover of Symphony of the Night. It also inspired the design of the N64 games. 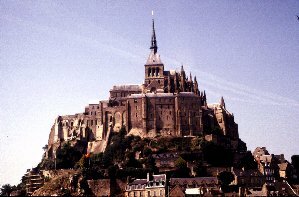 The foundations were set down in 708, named after Saint Michael, who appeared to Bishop of Avranches in a dream. 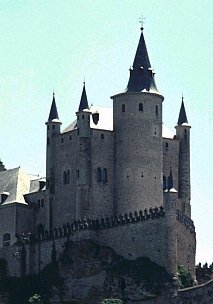 Check out Castles.org and Medieval Castles. Used in the instruction manuals of Akumajou Dracula X68000 and the Japanese Nocturne in the Moonlight. 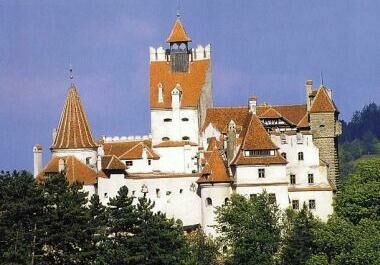 On an unrelated note, it was also used as the basis for the castle in Disney's Snow White and the Seven Dwarves. Originally a fortress, the Alca'zar has also been a royal palace, the site of Philip II's wedding to his fourth wife, Anne of Austria, and more recently a military academy. In the upper part of the city, the oldest foundations have been identified as Roman. Documents indicate that a fortress existed on this site by the early 12th century known as the Alca'zar, an Arabic word for a royal residence. The palace was enlarged in the 13th and 14th centuries and again during the reign of King John II (1405-1454) when towers were added and the East Tower and moat were enlarged. 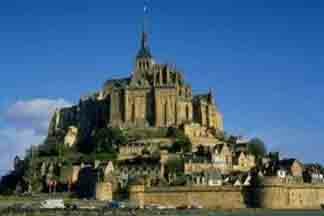 Under Philip II (1558-1598) major alterations were made; slate roofs and spires on towers were added. From 1764-1862 the Royal Artillery College was housed here. A fire in 1862 destroyed most of the structure, which was rebuilt about two decades later in a more romantic style than the original building. 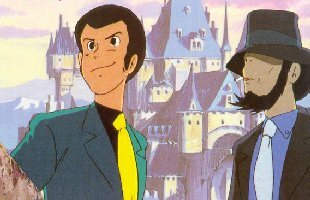 Not a real castle, but from the Hayao Miyazaki animated movie Lupin the 3rd: The Castle of Cagliostro. 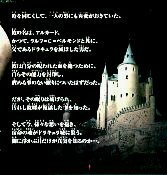 This seems to have inspirted the ingame graphics of the Dracula X SNES game. 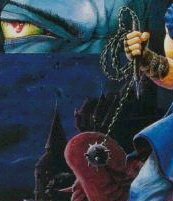 The castle in the background of level 4 (Germany) in Castlevania Bloodlines. 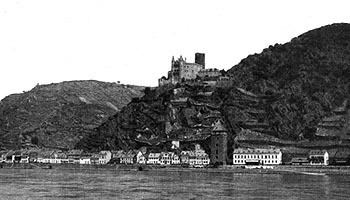 The castle is set like a crown on the hillside overlooking St Goarshausen. It was built by Count Johann of Katzenelbogen at the end of the 14th century. Destroyed only in 1804 and restored a century later, Burg Katz today houses a Natural Science Grammer and Boarding School. The path by which the castle is reached leads under the three-sroreyed main hall into the courtyard. The view, especially to the Loreley southward, is held to be one of the Rhein's best known. Burg Katz is private and closed to the public. More info here.